Having witnessed Full Circle playing live, I know them to be four incredibly skilled musicians who bring everything they can muster with hands, mouths and minds to the live arena, to create a piece of music spontaneously and from scratch. 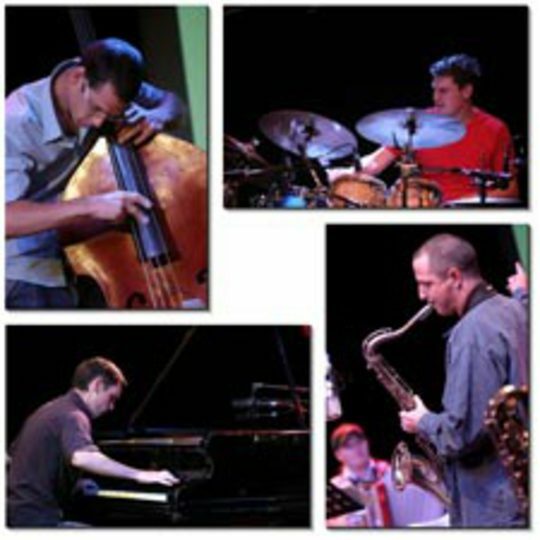 The band can be filed loosely under Jazz, but it's only because that particular genre has the (increasingly undeserved) reputation as the home of improvisation. They will find truer bedfellows within the brave new world of European Improvised Music and this first album captures moments in time from their studio sessions and live work from the past year or so. The first few seconds of the album lean to a Debussy-esque fantasy with piano and soprano sax but before long, the four players move off into different territories, before shifting once more on to the next. As with Debussy, who reflected the Impressionist era of his time, they encourage the mind to journey through inner- and outer space, and anywhere that it wants to go, on a mission to leave the formulaic and regimented behind. As the album moves through its eight tracks (entitled Parts 1 to 8 - so no clues there about how you're meant to feel,) a sense of freedom is conveyed by musicians who are actually expressing themselves. How strange that we are more likely these days to hear that term applied to footballers than musicians! Several 'Parts' require a bit of listening effort to prize open their doors as not all the music here is instantly accessible or necessarily appealing, but surely that's the point. Fitting in with expectations has to be anathema to those working within this experimental field. But how free is free improvisation? Does everyone just start playing and then the band's tough guy pushes his way to the front, or do they take preordained turns to lead the tune or the mood? Could it be that band members practice interesting little motifs in the cool of their solitary rooms and then patiently wait to slot their ditties into an appropriate theme when the moment comes? But if the night's "experiment" is good, then why don't they want to repeat the joy note for note at another gig? My mind's eye can see those who practice this mercurial art laying down a selection of improvs and then talking long into the night over a bottle of JD, as they cruelly exert the power of life and death over their creations. In theory, it seems strange to offer a permanent recording, a CD, of something that is designed to come into life and then depart, but as an "invitation to the dance," it's a tantalising glimpse into, as the ex-King Crimson pianist Keith Tippett has said of this new genre, "the closest you will get to democracy in Western music". This is new stuff. 'Explorations' is a thing of beauty. It is also a thing of ugliness, elation, obtuseness, manumission, humour and mistakes. What a welcome breath of fresh air!